1. Sleeping – Although hostels are great, take a break from them. Don’t be spending your entire time in hostels getting drunk! 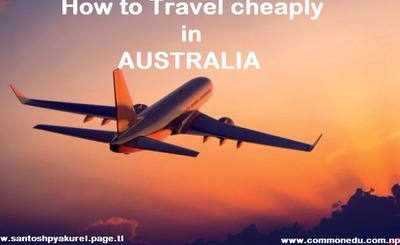 Camping is the best option for travelling cheap in Australia. A tent can be bought for $15 – 20 and some nights you will camp out for free. Make it your home for the next few months as you “backpack” round the land down under. Most campsites have toilets and showers, lots of them are even close to places where you can get part time/temporary jobs. 2. Eating – If you insist on eating out – then head to pubs that do $10 steaks and such offers. They often throw in a beer or a soft drink for this. One of the tricks I used while in Australia is monitoring pubs that did cheap big meals and the times they apply. I found that most of them are lunchtime specials. In which case, it’s hardly a big deal to transfer your main meal of the day from dinner to lunch. Eat cereals and toast for breakfast. Don’t be afraid to venture into Hungry Jacks or McDonald’s for a cheap breakfast either. Hungry Jacks also offer unlimited refills – take your flask in. They’re not going to chase out paying customers. And McDonald’s has free wi-fi. If all else fails stick to vegemite sandwiches! Top notch! 3. Transport – Don’t be flying round Australia! I spent almost 2 years living there and didn’t once use an internal flight. Use Greyhound and book early, or better still – meet up with others, buy a car and off you go – you’ve got your own vehicle now which you can sleep in and drive to campsites with. Share the petrol costs and even get a job and share lifts to work. And if getting a Greyhound, of course get it at night to save money on accommodation (simple obvious things by the way). Gumtree, hostel notice boards and travel websites also offer carshare options. 4. Get a Working Visa (of some kind) – I can’t understand how those that are eligible for a working holiday visa in Australia don’t use it. The amount of travellers I met in Australia that said “we’re only here for 3 months so we’re not working” then followed it up by “this place is dear”, well why didn’t you just get a working visa then? Even working for just a week or two in Australia can earn you over a thousand Australian Dollars. 5. Entrance Fees – Again it sounds obvious but don’t be paying entry into places – there are loads of FREE things to see and do in Australia. Hiking for one, some amazing landscapes to see, beaches (completely free), fancy dress parties (make your own costumes for free), museums are often also free entry (including the amazing War Memorial in Canberra), as is walking across Sydney Harbour Bridge. If you want to see Koalas and Kangaroos – these can all be done for free. Kennet River on the Great Ocean Road is a decent spot for Koala watching at sunrise. Kangaroos and wallabies are hard to miss. 6. Coupons, vouchers, tokens – The amount of travellers I met who never bother picking up those brochures, fliers etc. that lurk in bus stations, airports, pubs, hostels, tourist information centres etc. – I kept picking up these brochures and finding money off coupons, savings on tours etc. Bars often even give out a free beer to entice you in – go in, take your free beer and leave. 7. Woolworths and Coles value brands – i remember meeting a couple of English girls moaning about the price of everything in Australia while drinking Del Monte orange juice for breakfast along with Kellogg’s Cornflakes! If you can’t take yourself down a rung or two for a few weeks or months by buying the value brands, then you honestly have no ground to stand on moaning about the price of things! 8. Nightclubs after 10pm – did you really go to Australia just to attend expensive nightclubs? I certainly didn’t! You’ll notice that after 9 or 10 pm (especially on weekends) the prices of drinks go up. Seriously to all those backpackers in Australia – get yourself a carryout, a box of goon and some tinnies and sit with your new found friends. 9. Internet – I also met a couple of guys in Brisbane moaning about the price of the internet. I never once paid to use internet in Australia. Leave Facebook alone until you really need it. What do you think travellers did 20 years ago before the likes of Facebook? Exactly! Get to meet people in the hostels and campsites and hang out with them. I went 5 weeks without being online when I was in Tasmania. I had some experiences and travel tales in that time that I wouldn’t have got sitting on Facebook! If you really, really insist on using internet in Australia at least be clever about it – maximise your usage of it when you have it for free in a hostel while you have it. The next campsite or hostel may not have it or may charge for it. If all else fails, bring a small laptop with you and buy the cheapest coffee in McDonald’s and sit and use their free wifi (free all over Australia and normally for about 20 minutes). 10. Don’t book things in advance. Why pay a deposit online for a hostel that you will stay in next week? Scared it will sell out? In the event of that type of thing ever happening, you’ll have your tent and can offer to sleep in the garden for a $5, most hostels will take pity on you and let you sleep on their sofas anyway. Book as you go, and if its hostels go into the cheapest dorm. 11. Laundry – The obvious is to wear the same clothes over and over again, and hand wash them. Done that myself manys a time. If you really feel the need to use laundry – get 2-3 cotton buds on sticks and stick them in the coin slots in the machines to get free laundry. Most of you reading will know this trick. A well known travellers “secret”. 12. Fake student ID – Again things become cheaper when you pull out a student car. Nobody really cares if its fake or not. Give it a risk and save some dollars. Honestly, folks this might sound like a bit of a rant and in many ways it is, BUT I just really want to let people know that Australia is a magnificent country and a great place to go. And it’s cheap if you know what you’re doing!! Those are just a few of my tips – there are tons more ways to save money. Thank you Jonny for this Contribution. I hope this will be useful for students/travellers. We assist on Student Visa, Dependant visa, Tourist visa for Australia. We can be contacted at Ph: +977-1-4010675, 9845536915, info@commonedu.com.np. Location : Putalisadak, Near kumari Bank Ltd.
Till today, there have been 14891 visitors (25004 hits) on this page!